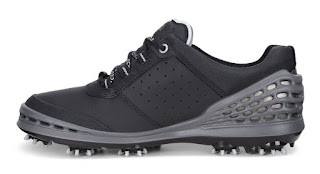 For the past few seasons, I have been looking to replace my go-to black Adidas golf shoes, which had been getting more and more beaten and worn with each round I played. Because I like how the black golf shoes looked, I wanted to stay with that color. I also wanted a shoe that featured replaceable spikes as opposed to a golf shoes that had molded spikes in the sole. So I began a search that has lasted for several seasons. I looked first at Adidas, which I have worn exclusively since the late 1990s, but I didn't like the contemporary styles that now popularize their brand. The same was true with Foot-Joy, one the most popular golf shoe on the market, and Nike. With those virtually eliminated, I began to focus on off-brands such as New Balance, Skechers and Ecco. I wear New Balance trainers at the gym and was intrigued by their Golf 2004 model. Skechers has been carving out a niche on the professional golf tours, and a few of their models seemed worth exploring. But I have always been fascinated by Ecco, a European-based company, whose golf shoes are worn by pros such as Fred Couples, Ernie Els and Graeme McDowell. While they had several models I strongly liked, I always had concerns over sizing (I wear a 9.5, but Ecco is 9-9.5) and their high price was more prohibitive. The weekend after July 4th, I was in Rehoboth Beach, Del., for a family celebration. There are several outlet stores there, including New Balance, Skechers and Ecco. I decided this was possibly the opportunity to pull the trigger on finally replacing past-their-prime Adidas golf shoes. Fortunately, my cousin was also looking for a new pair of golf shoes, so we could possibly take advantage of any discounts that were being offered. After he struck out at the Nike outlet, we ventured over to Ecco. I quickly zeroed in the Men's Cage model in black, which was on sale at $60 off the regular retail price. I tried on the 9-9.5, but they felt a bit big, so I moved to the 8-8.5 size, which felt better. Ecco was also offering a deal that if you bought one pair, the second pair was 40 percent off. My cousin also found he liked so we were able to split the discount and each get another 20 percent off our purchase! 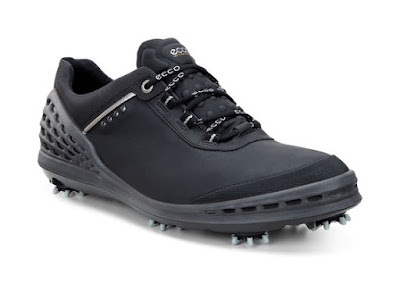 I have worn my new Ecco golf shoes now for three rounds, including one walking 18 holes. They look and feel great. The Champ Zarma golf spikes on the sole provides a great base and traction from all types of stances on the course. It was definitely worth the wait in replacing my old golf shoes and I give these Ecco shoes a high recommendation. I can see now why Couples, Els and McDowell trust their feet to Ecco. After winning back-to-back U.S. Open titles earlier this year, Brooks Koepka added to his list of majors by winning the PGA Championship last weekend. 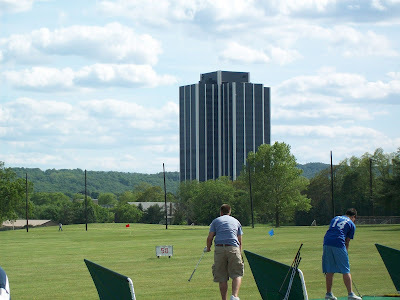 During the week, I learned that Koepka's mother is Philadelphia-area native Denise Jakows, a longtime news anchor at WPTV in West Palm Beach, Fla. She is also a former college classmate of The Muni Golfer--we both attended Temple University's Klein College of Media and Communication during the last 1970s-early 1980s, worked as student reporters for Temple's FM radio station, and even had a class together. Even then you could tell that Denise was bound for big things, so it is no surprise her son is a three-time major champion golfer. 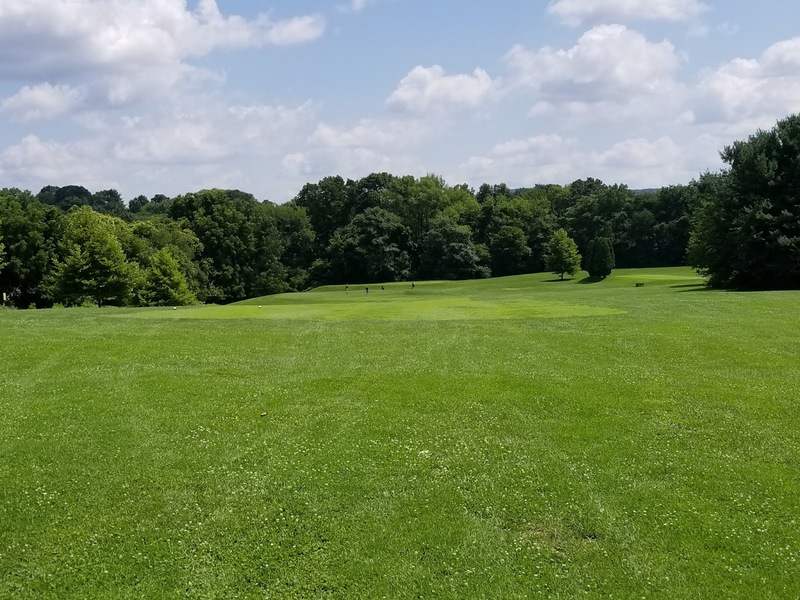 Several days of heavy rains gave way to for a brief respite yesterday, allowing for 18 holes of golf under eventually sunny, skies and humid temperatures. But even though the sunshine beamed down on the Fairways, the course was water-logged in places, making for some sloppy play during the round. The rule of the day was cart paths only and bunkers were often mini ponds. Puddles could be found in numerous places and many times, the water squished under your feet as you took your stance. Still, it was an opportunity to play golf, no matter how wet the conditions. Following last week's round in Bethlehem, Pa., under similar wet conditions, I managed to play much the same way. I shot an identical 90 for my round. My problems at the Fairways were much the same as they had been, when I hit it poorly off the tee, big numbers follow. I made an 8 and two 7s on the front nine (a 46) and each could be traced to a very bad tee shot. The back nine was a little better (a 44), as I was able to overcome my errors off the tee. I had put a TaylorMade AeroBurner driver in my bag for this round and it did me very few favors in finding the short grass. On the three holes on the front nine where I can hit driver--1st, 2nd and 8th--I topped my drive (1st), hit it way right (2nd) and plunked a ball in the creek (8th). Only at the 2nd Hole was I able to recover and make a par. On the back nine, the three holes that require driver: 16th, 17th and 18th, I fared no better, missing all three fairways short and in the rough. Needless to say, that driver will be replaced for the next round. 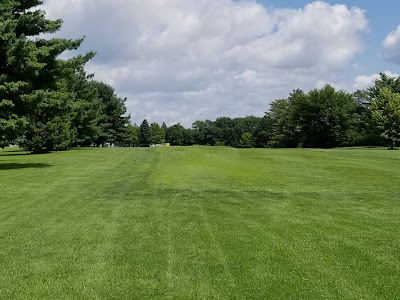 While visiting family in the Easton, Pa., on Saturday, I had a chance to play 18 holes at Bethlehem Golf Club's Executive Course. The nine-hole Executive Course, along with the 18-hole Monocacy Course and Driving Range, comprises the City of Bethlehem's wonderful public golfing complex along Illicks Mill Road. 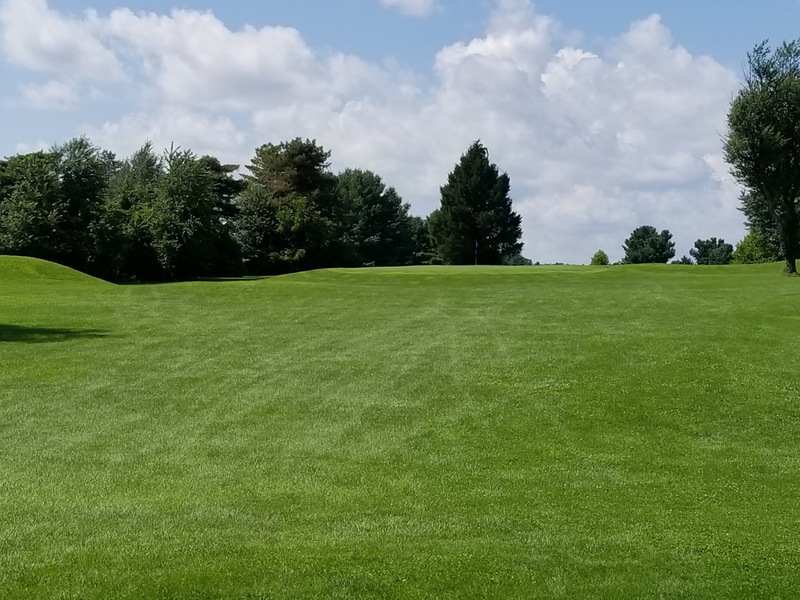 I have played the challenging 18-hole Monocacy Course, which used to play 6,679 yards from the white tees in the past, but on this occasion I opted for the nine-hole course instead. I like the shorter course because it offers a great opportunity to work on your game while getting in a round at the same time. For only $19--the non-resident rate--I could play as many holes as I would have liked and I have played 27 at the EC in the past. Also, there are no carts on the Executive Course, which meant I walked a round for the second time this season. Due to severe rain storms late last week, the course was very soft, making it play a bit longer, and puddles could be found around the course, although none affected play. On this Saturday, they only had one set of tee markers, so the nine holes played the same both times around. The one thing I didn't like was there are no yardage markers in the fairway, so approach shot distances are strictly by feel. I often under-clubbed during my round, but this also gave me the opportunity to practice my short game on almost every hole. I also used my 4-wood and hybrids off of most of the tees on the Par 4s. I was a bit disappointed with my play on the front nine. I had some good holes and a couple of very bad holes. I did make two pars, but I wasn't happy with my 46. The back nine was better, but my score was almost identical with a 44. 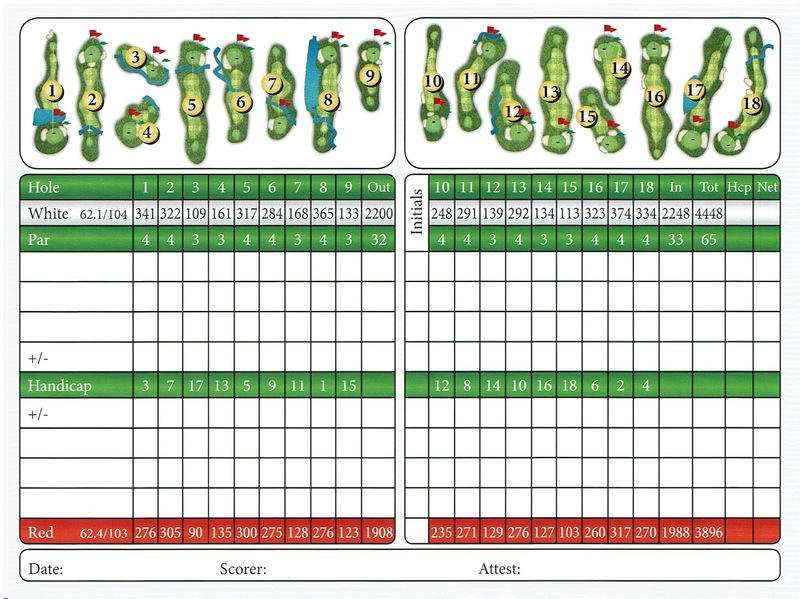 I was happy in the fact that as I approached my closing three holes--16 (Par 4), 17 (Par 3) and 18 (Par 4)--I pretended I needed to shoot no worse than two-over-par to score a 90. 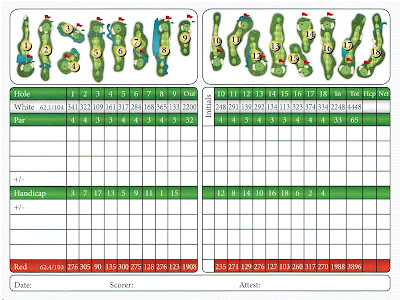 I parred 17 and bogeyed 16 and 18 to shoot 90!